My friend Ronnie says he likes the short posts. Merry Christmas. I toyed with the idea of blowing up this dish a little. Not going to say how, because I still may and it'll be a future post. But it's a bruschetta. 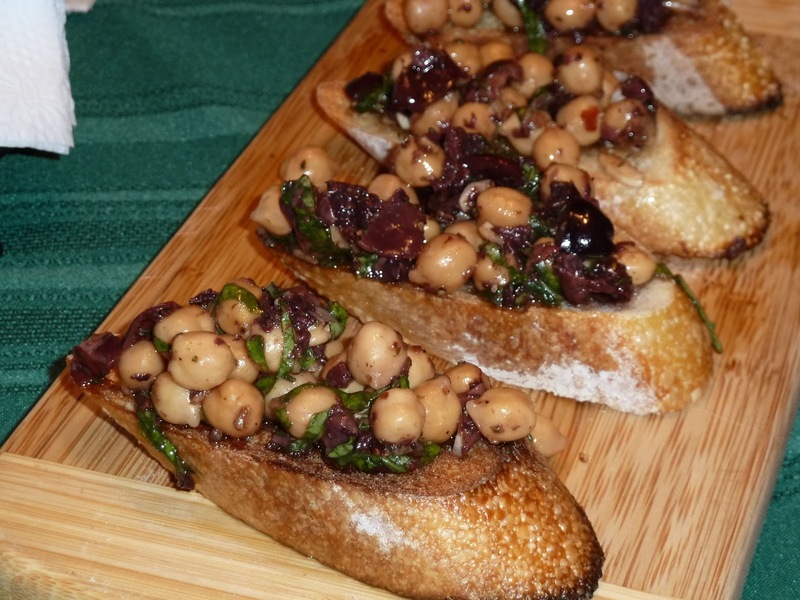 Toss some chickpeas and olives with some other stuff and put it on bread. I could make it sound complicated in some way. I guess I could have grown, dried and rehydrated the chickpeas. But I didn't. I opened a can. Like the recipe says. This was the first dish where I was at a decided disadvantage not being in Florida. I ran through the ingredient list on this one, and was like, yeah, I want tuna for dinner tonight. Let's do this thing. So I went to BlackSalt and picked up a beautiful hunk of tuna. Then I went to get everything else. Shiitake. Done. Radicchio. In there. Mizuna. Got it. Blood orange. Blood orange? Where's the blood orange? Turns out that here, some citrus is seasonal. That never really happened in Florida. 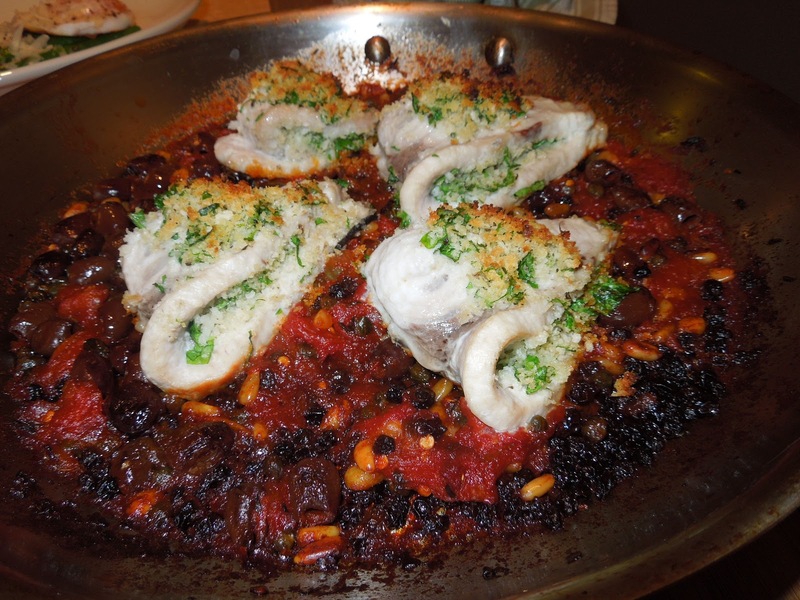 So now I had a fairly expensive chunk of fish and most of the parts I needed to do the dish, but no blood orange. 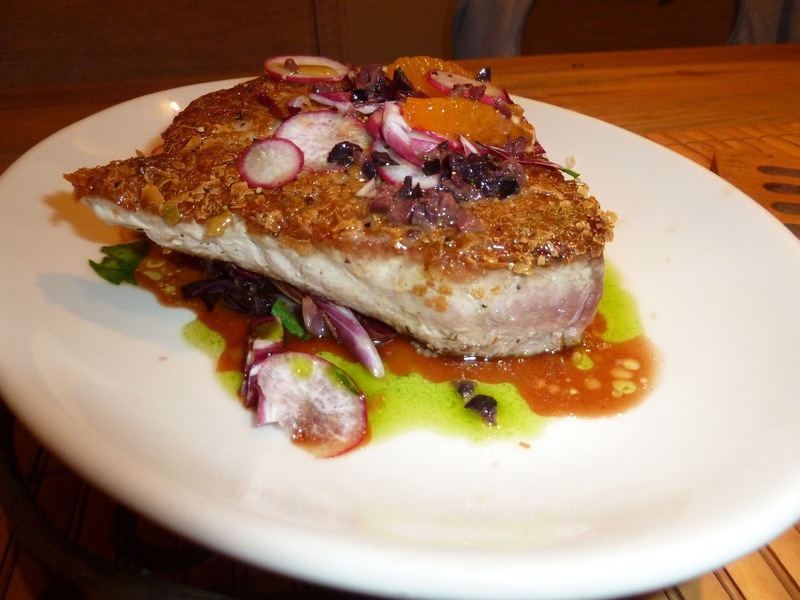 Worse: The name of the dish is Big Eye Tuna al Tarocco. Guess what Tarocco is? So, I called everywhere, and was told I would not be likely to find a blood orange anywhere in D.C. for several months. So I bought an orange orange. I thought I'd get smart and soak orange segments in Aperol, a digestif that has a bitter-citrus flavor and the color of blood orange. So, technically, what I have here is Big Eye Tuna al Arancio. And for now, that's fine. I was itching to cook something. It had been awhile. What was in the book that I was sort of eager to make, that had almost no chance of being bad and wouldn't require a ton of running around for ingredients. Having a well-stocked kitchen, the only thing i needed to buy other than the fish was some olives. And that was only because it called for gaeta olives. I almost always have olives on hand, but not necessarily gaeta. I'm still not sure whether what I got were gaeta, but they were small, and they were olives. Done. About 20 minutes, and dinner's ready. In prepping to cook through this book, I looked at all the dishes to assess which I might not be crazy about eating. The dishes in the book include cow brain, stomach lining (internal and external), jellyfish, thymus glands, pig heads, raw lamb, lamb tongues and several species of liver. Cool with all of that. I was not looking forward to the cauliflower. I try to reserve hating any foodstuff. But there is really nothing worse than cauliflower to me. From the first time I had it, so many years ago, it's something I have trouble swallowing. I tend to chew it and chew it and chew it until i realize the only reason I'm still chewing it is because I'm actually afraid to swallow it. And by then, it's even worse than when it started. And it started out bad. I try to avoid hyperbole when it comes to food, but I honestly have no idea how people eat that stuff. The good news is, I love pasta. And I'm always willing to have my mind changed. 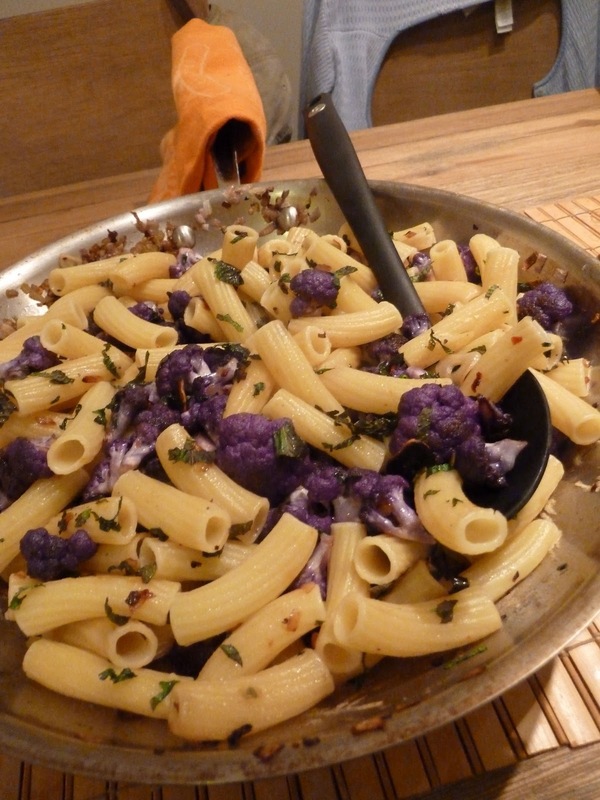 Also, I saw cauliflower that was orange, and I saw cauliflower that was purple. Those are two of my favorite colors. If I'm unlikely to like it anyway, maybe getting a different color will help? "It tastes exactly the same," the guy at the farmer's market tells me. "Shut up and let me dream," I say to the guy at the farmer's market. In my head. Out loud, I just said, "OK, thanks, I'll take purple." I tried. I really, really tried. But I just kept chewing, and feeling the sulfur waft up through my olfactory lobe, and remembering all of the trauma of being forced to eat cauliflower with cheese sauce when I was 8. I could spare you the details, but no, you know what you signed up for when you opened this post: There was gag reflex. Eventually, I started picking through and just eating the pasta, which was really good, especially when it had mint and chili and no cauliflower on it. 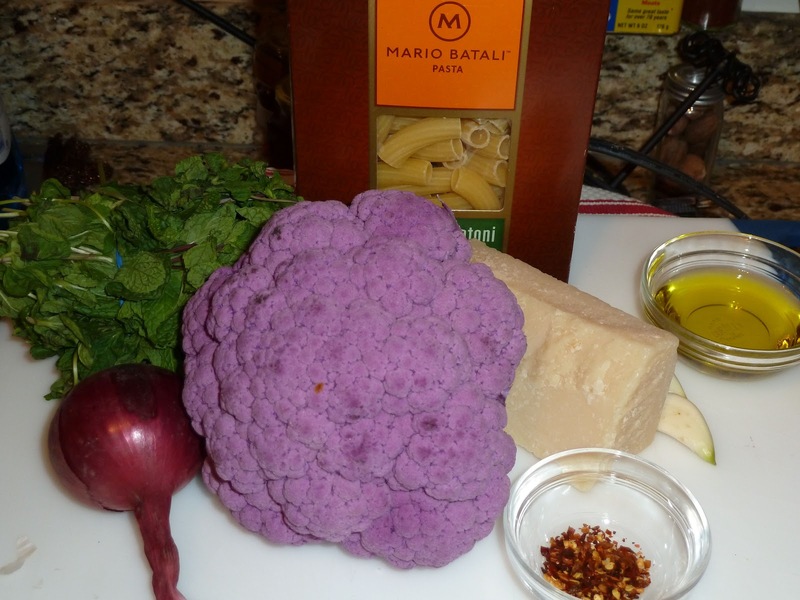 Avoiding the cauliflower was really pretty easy, it turns out, because, well, it was purple. It stood out against the pasta. So in the end, the purple totally came through for me.